Lentils are a member of the legume family, and with their small, delicate shape and nutty flavor, they are a versatile bean. You can use lentils in soups, salads or as part of a side dish. Often sold dried, lentils are soaked in water before getting cooked. Adding spices and changing your cooking method can alter the taste of lentils, which are full of nutrients. Lentils are often boiled before they are drained to be added to soups, stews, salads or other dishes. 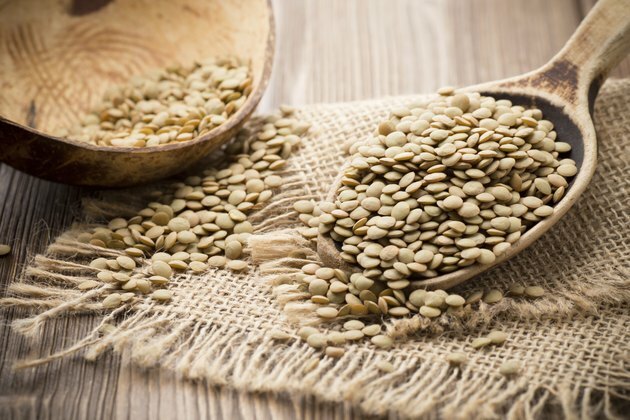 While water is the most common cooking liquid for lentils, cooking lentils in broth -- vegetable or animal-based -- will greatly boost the flavor, making these rich little beans even tastier. A 1-cup serving of chicken broth has only 10 calories per serving and almost 0.7 grams of protein. It has a little over half a gram of total fat for the same size serving. In turn, a 1-cup serving of vegetable broth has 12 calories per serving, but no fat or protein. Use the same amount of broth to cook your lentils as you would water, roughly 1-cup of lentils to 2-cups of liquid. Cooked drained lentils can be mixed with freshly chopped herbs for a delicious, nutritious and low-calorie boost of flavor. While sticking to classics such as fresh parsley will add a welcome splash of color and a vegetal note, try for slighty more exotic herbs as well, such as lemongrass, garlic, ginger or cilantro. Many herbs are high in a number of nutrients, so they will help boost the nutritional profile of your lentil dish. For example, cilantro is rich in potassium and iron, garlic is rich in selenium, calcium and magnesium, and lemongrass is rich in manganese, copper and zinc. While you can boil, drain and serve lentils, you can also change the cooking method to alter their texture and taste. After boiling and draining lentils, add them into a stir fry for a hearty cold-weather dish that is filling and nutritious. You can also add lentils to casserole bakes, where their texture becomes slightly firmer and their richness lends extra depth to the casserole. Lentils can also be pureed after they are cooked, to make a nutritious dip similar in texture to hummus. If your standard lentil dish involves lentils with rice or lentils on their own, consider mixing them in with other vegetables. Not only will this make your dish more nutritious overall, but it will also add color and variety to your meal. Shredded dark leafy greens can be mixed with cooked lentils to make a simple salad for a light meal. Options include kale, which is high in potassium, calcium, iron and vitamin C; and spinach, which is rich in vitamins A and K. You can also combine lentils with crunchy vegetables for textural contrast, such as carrots and red peppers, both of which are rich in vitamin A and B vitamins.